Holy Island, the Farnes and the Breamish Valley make Northumberland one of the best areas in England for seabirds and moorland birds. 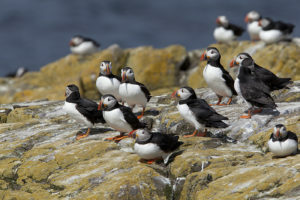 Susan & Allan are a husband & wife professional photographic team producing images on most aspects of natural history. Allan’‘s other photographic passion is aviation photography. They have been professional photographers for thirty-five plus years. They have travelled throughout the UK including many of the Scottish Islands; extensively around Spain, and other areas around the Mediterranean. Other trips have taken in Florida and Texas in the USA. For a period of twenty or so years Allan was employed as a tutor by the Workers’ Educational Association and helped by Susan taught Birdwatching and Natural History skills at venues in Sheffield and Chesterfield finally retiring in the Spring of 2007 due to other commitments. In the past he has been employed, teaching the same subject, for The University of Sheffield. Allan is an Associate member of the Royal Photographic Society gaining his Associate Distinction with a panel of bird images. Allan & Susan have had Natural History and Aviation images published throughout the world via their Picture Agencies. Allan and Susan are long standing members of both the RSPB and the Norfolk Wildlife Trust and Allan is a past President of the Rotherham Ornithological Society.